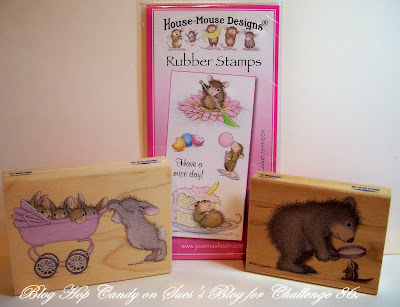 Lots going on over at the House Mouse and Friends Monday Challenge. each month, to participate in our 2 challenges for that month! For our very first GDT member, Tracy was chosen! Congrats, Tracy, and welcome aboard for the month of January 2011. Curt O'Brien, our former teamie, has also agreed to rejoin us for our Blog Hop! Good to have you back for this challenge, Curt. As you participate in the blog hop, there will be hidden candy along the way on several of the design team member's blogs. Here is my candy. There are several sponsors giving some fabulous prizes on the House Mouse blog site for this blog hop. You should start the "HOP" at the House Mouse Blog site where you will find a list of the participating sites. While you're there, check out the fantastic design team cards and get inspired to take part in the challenge! If your coming from Sue C's Blog, your in the right place. What better new beginning is there than a new baby? And this little guy is getting a big assist from two really cute House Mouse pals! I colored with Copics, the tag is from Stampin Up. Card stock is by Me and My Big Ideas, Baby Boy Stack. Red pearls on corners by Elements. Punched border is Martha Stewart. Aww, bless their little hearts! Baby bottle charm a gift, thanks America! OK, so let's get HOPPIN!! hi sue first, the best wishes for the new year that we have a lot to admire your beautiful creations. what a great price is there to win! the house mouse with pushchair has a longstanding desire of mine so much that I can join for a chance to win him many thanks for that. your card is sooooo gorgeous!!!! amazing colloring. Aww this image is so cute! I don't own any House Mouse stamp, but after seeing all the beautiful creations on this hop, I want some stamps too! I love it! I want one! No, I need one!!!! 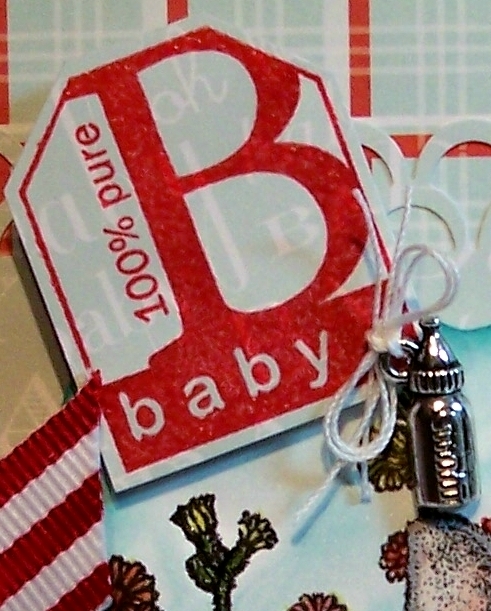 What a cute baby card -- love all the pops of red. Oh Sue how gorgeous this is!!!! Hi Sue hwat a stunning take on the NEW chall them LOVE IT..great image & the colouring is TDF fab piece of work teamie. What a fun image! I love the color combination! Wishing you a Happy New Year and a nice day today! 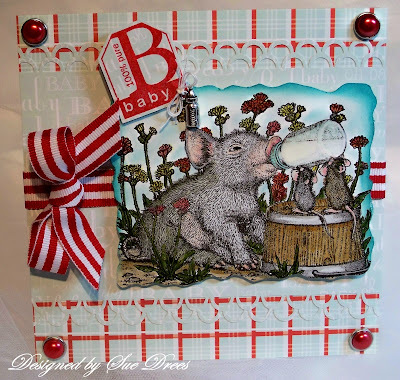 Hi Sue, what a fabulous card - just look at that cute little 'piggy' = fantastic image for a new baby card, lobe your layout,gorgeous colouring and details, love the stripey ribbon!! Bestest wishes for the new year, just discovered this wonderful blog hop and your card is definitely too cute! Reminds me of Charlotte's Web! What a wonderful card Sue,I love the image and the colours. this card is beautiful sue. Lovely card, your colouring is perfect. Thanks for the chance to win. Best wishes for 2011. Hi Sue~Happy New Year. I am loving catching up on your blog. It has been a while. This card is fantastic but so are the others. Just gorgeous work. You inspire me, thank you. I have needed it a lot lately. I have not created anything new in months.Take care sweet lady & thanks for sharing your special talent with us all. I've always thought this stamp was so cute. You made an adorable card with it. I'm gonna have to get this stamp! Brilliant card -I just sat & looked at all the detail - decided I'd Follow too for I scrolled down your earlier posts & that blue brayered resist is such a stunner. I've started working with those too & it's so good to see someone else working in different styles. I've not any Mousies yet but they're on my list so I'm going through the hop carefully & learning lots on the way. Thanks for such an educational visit. Your creation is amazing, I adore your image, I really need this one Lol! Nice to work along side you on the hop. Awww, what a cutie! I love your stamp and great colour theme too! Happy New Year! May your creativity continue to flourish in the coming year. Love House Mouse - own many! Thanks for the chance to win some candy. I love this stamp and your colouring, Sue! I love the red and white, just fabulous! Love this card and your coloring is wonderful! The blue edging really makes it pop! Cute card, reminds me of Charlottes’ Web! Great coloring job and embellishments. Oh My Goodness totally adorable! Love the ribbon you used and the border punch. Nice! This image is absolutly ADORABLE! Fantastic colouring and layout is perfect!! What a sweetie! love your colouring, love that stripy ribbon. Fabulous card, I do so love house mouse stamps. Great blog hop! Here's little me & want to join the blog-hop. I love your beautiful card! The cutest little pig in town! aaww.. that is very cute! Your card is gorgeous and the image is very sweet. Very cute card. You did a marvelous job on it... Amazing coloring. Love the house-mouse hop so far, so many wonderful cards to drool on.. This with the piglet really is too cute for words, what a sweet card! How cute is that image - love it. Awww such a cute card .. love that iamge. This card is super duper cute!!!! that pig is sooo adorable!!! love your coloring on this!!! Have a Happy New Year!! The coloring on this card is fabulous! Love all the embellishments too. That image just makes you smile. :-) Happy New Year! Your card is to cute, and your colouring is amazing, great job!!! the colors are fantastic. The card is fantastic. You are fantastic. How sparkly and wonderful! 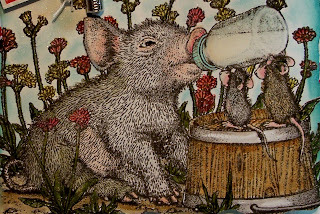 Love the cute piggie and ofcourse the stars of the show (House mouse cuties) are just the best! Ack, that piggy is so adorable! Thanks for sharing, and for the chance to win! Hi, gorgeous card, lovely image & colouring! Beautiful Sue, your colouring and the way you put your cards together just blows me away! Love it. Happy New Year to you too. Love your card Sue! This stamp is so cute!! I've made a card with the new beginnings challenge too. You can find my card here! A really adorable card! I didn't know this cute image yet! P.S. Also love your blog header photo- amazing! oh no, what for a beautiful and gorgeous Babycard. I like it so much!!! Oh so cute - I like the bright touches of red. Gorgeous card - love the image! Thanks for the fun blog hop. Thanks for your visite! I love this card and your blog! Lovely card. Your coloring is great. Thank for the chance to win this awesome Candy. I love this pig drinking his bottle! Very cute image! 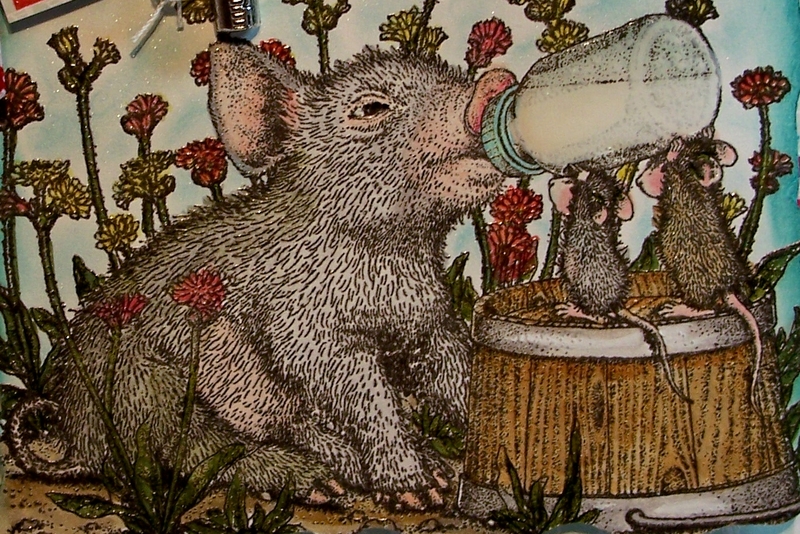 what an adorable baby card you've made, love this little pig drinking his bottle. What a sweet baby bottle charm you've used. Supercute! Thanx for sharing this amazing candy with us. It´s a fantastic card! I love the image! Such a lovely card! Best wishes to you too. Your colouring in this is just soooo perfect! Love the image, another stamp on my wish-list!! New fan of House Mouse. They are just sooo sweet! Happy New Year! Great card, love the image. Great ribbon detail. I am hopping along, enjoying the blog hop and all the wonderful and funny cards. Perfect little piggy! My mother loves it toooooo! What a great image. Love House Mouse and his friends. Wonderful card! This is such a detailed stamp! I love the colors you used, the red and white ribbon is fabulous! I don't have a blog and don't know how to follow people so that is out, sorry! I just love your choice of colours and the little details. What a sweet card. I love your foto from the Niagara falls.